This entry was posted in CNR D-1, equipment by Trevor. Bookmark the permalink. Trevor, What about the new Stanton Drives from Jim King? That is a really neat project. Do you need to apply Archer rivets to the printed body? If you need help with the underbody details? I have drawings of NP gas electrics including appliances if you need a guide? It’s a good question, Gene. I’m not sure what rivets (if any) are required, and whether Stephen has added those to the print. If necessary, I’ll add them. Thanks for the offer on the drawings. I would love to see some. I’ll contact you offline. Sorry i couldn’t be there for the frame cutting or delivery yesterday. Glad to be helping with a project like this, as my HO Scale version that is nearing completion won’t see nearly the public showings as the S Scale will hopefully see with the S Scale Workshop layout. In terms of Rivets, Trevor will need a raft of Archer or similar to add the rivet detail, one problem i’ve never managed to resolve with the modelling software i have is getting something that resembles a rivet to export as a printable component when sent to Shapeways or other producers. The hazards of an expensive but older package that i have access to at work rather than some of the newer packages out there. Hopefully we’ll have the Shell modelling completed and the revisions for S Scale completed in the next couple of weeks so Trevor can place his order. I’ve had people express interest in going down to N Scale with D-1 as well, which like the HO scale version can take a Bachmann mechanism as a donor. What a unique piece! And a water jet cutter. Marvelous! Been trying to cut brass Roth my Water-Pik for years and getting nowhere. Cool project. Since you’re at the point of having a powered D1, keep at it! Anyone else wanting one could do what CN did with D1 most days; haul it dead behind a ten wheeler or pacific! I’d seen the model on shapeways in HO a while ago, and thought I’d like to have one. Now that Rapido has announced their icons of steam series, especially the 10 wheelers, I might just have to get a set! All 3 of you need to keep up the great work! I have made the HO Scale versions available on my Shapeways store. I have one more colour to spray on the D-1 body (black around the engine cowl), and then decals, windows and details. I just haven’t had any model building time the past couple of weeks to get anything done! After that, just some electrical work in the short term to install an LED headlight (my soldering iron has seen better days, i need to finally buy a good one before fiddling with soldering the LED). At some future point i will add DCC and sound to the model, but that’s low down my priority list at the moment. As i noted in another comment, because my 3D software won’t properly generate rivets, if rivet detail is important to you, you would need to go to town with Archer Transfers or similar. To my eye, the model looks fine without them (application of the 3′ rule is vigorous in my modelling world), i haven’t added them, because i simply couldn’t justify it, but it is something you can do if wanted. 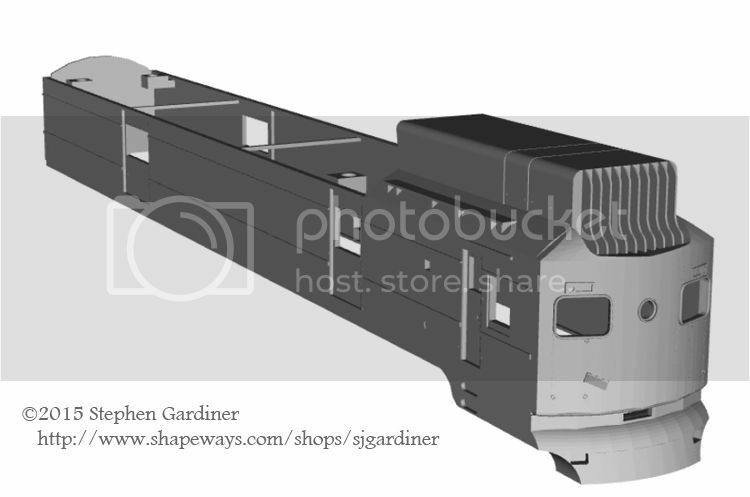 My Shapeways shop is at http://www.shapeways.com/shops/sjgardiner if you are interested in looking at the HO Scale version. I had a good day yesterday finding gremlins in the 3D model for the S Scale version for Trevor, i don’t want him to spend money on something if it won’t print or has serious issues, and the scale transition has kicked up some unexpected problems that didn’t appear in HO, but the change showed issues that needed fixing to make it work. I’m down to just drawing the mounting points on the body to attach it to the Frame and some minor details, and Trevor may be able to order his D-1 body. Interesting project, Trevor. I am admiring particularly that floor and drive. That’s some Bob Hegge-esque over-engineering, by which I mean appropriately simple, rugged, and robust. 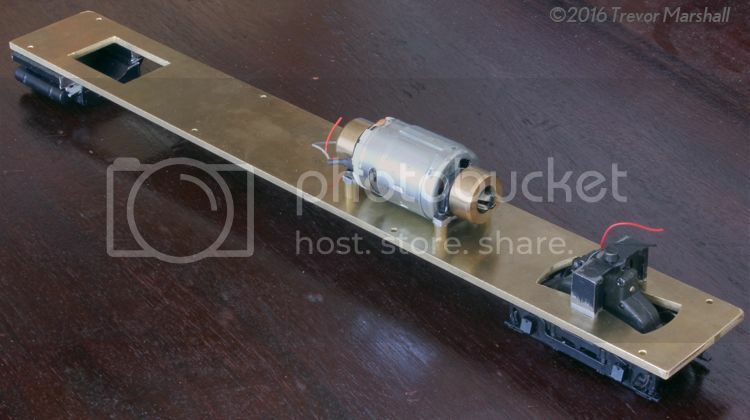 My own experience with repowering old brass HO electric MU cars has made me appreciate the peace of mind and subsequent fun that comes from large motors, flywheels, and solid engineering. I’m also intrigued by your engagement with 3D printing for the project. Will be watching to see your project take shape with this exciting new enabling technology. I’m doing a little 3D experimentation of my own, albeit in N scale, so it will be interesting to see your larger scale take on this promising but perhaps idiosyncratic medium. Looking forward to your progress . . . Good luck, Trevor, and happy modeling!